BSSA, 100:1, Electronic Supplement to Konca et al. This electronic supplement includes tables with error values and figures that are supportive to discussions of the main text of the article. Table S1. Determination of the best fitting dip angles assigned to the various fault segment derived from the inversion of the GPS and InSAR data with constraints on surface fault slip obtained from the SPOT measurements. We performed a grid search by varying dip angles systematically between 55° and 75° with 5° steps. Segments are numbered from west to east and models are ordered according to the quality of the fit to the GPS and inSAR data. The dip of segments 1 and 2 are kept the same since their strike directions are very similar. Table S2. Determination of the best fitting dip angles assigned to the various fault segment derived from the inversion of the GPS and InSAR data with constraints on surface fault slip obtained from the SPOT measurements. We performed a grid search by varying dip angles systematically between 55° and 75° with 5° steps. Segments are numbered from west to east and models are ordered according to the quality of the fit to the GPS and inSAR data. The dip of segments 1 and 2 are kept the same since their strike directions are very similar. Figure S1. 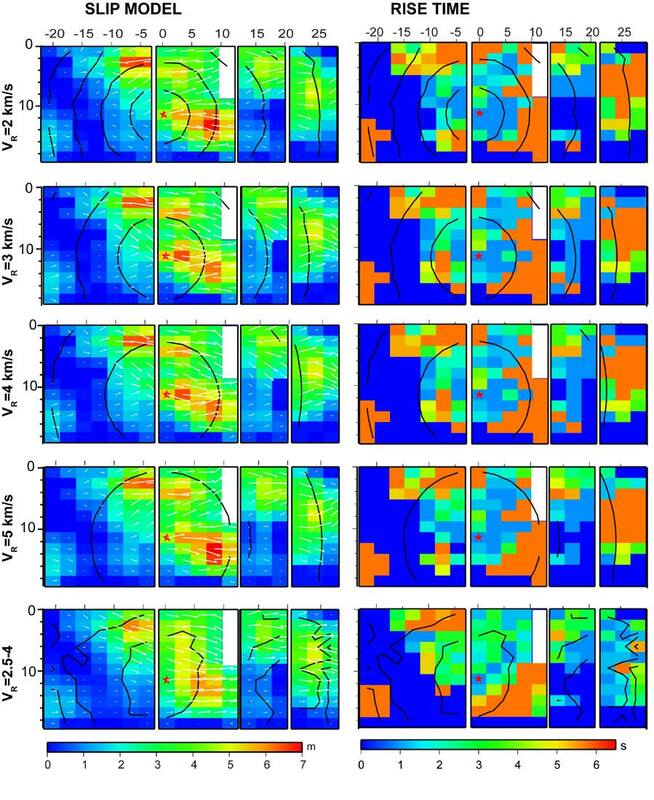 Test of the mutual consistency of the displacement fields derived from the cross-correlation of images 1 and 2; images 2 and 3, and images 1 and 3. 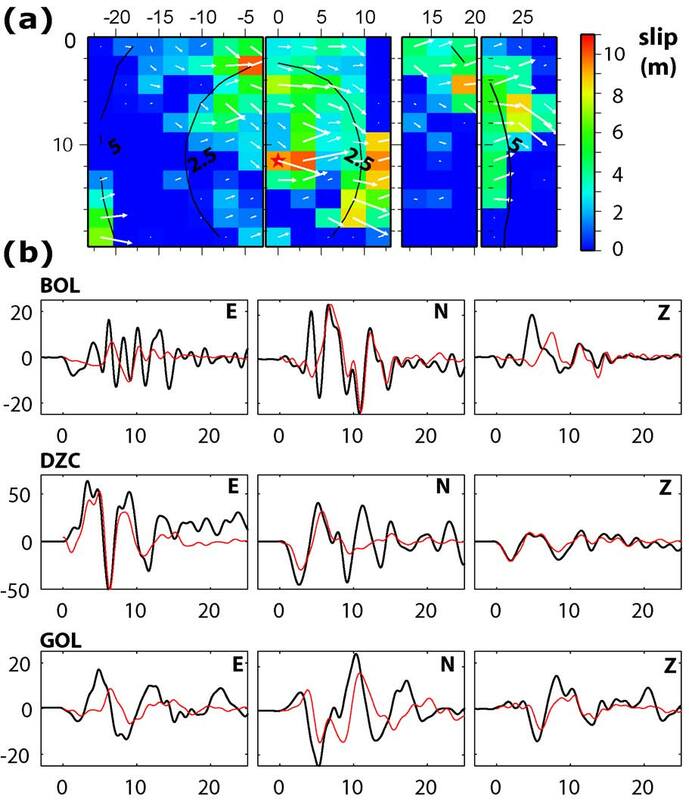 (a) shows the E-W displacement field derived from correlating images 1 and 2, with only the Izmit earthquake rupture, (b) shows the E-W displacement field derived from correlating images 2 and 3, with only the Duzce earthquake ruptures. (c) shows the addition of a) and b). 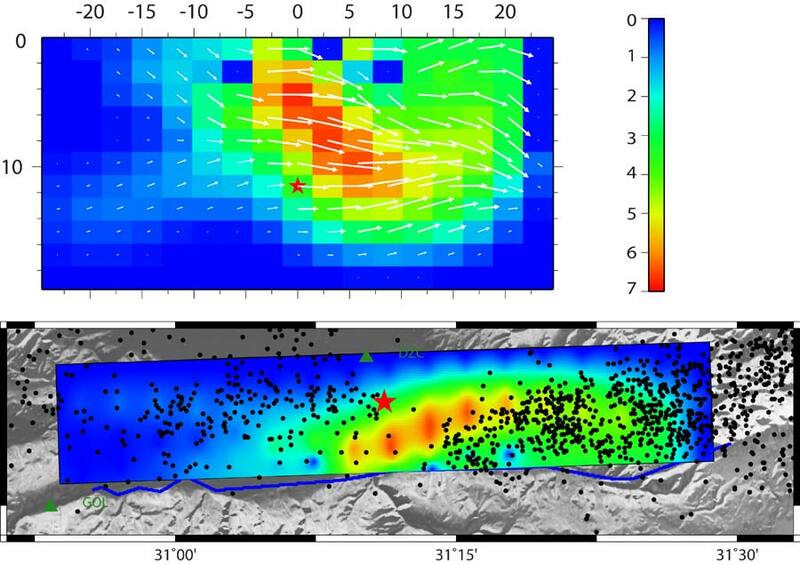 (d) shows the E-W displacement field derived from correlating images 1-3, with the Duzce and Izmit earthquakes ruptures. (e) is the difference between (d) and (c). Figure S2. 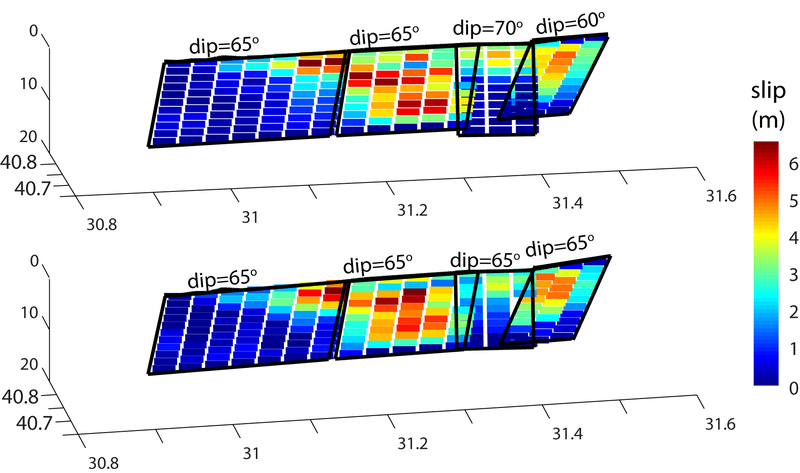 3-D view of the slip models of the best fit geometry (top) and the constant 65° dip angle (bottom) shows that the slip models are very similar. Figure S3. 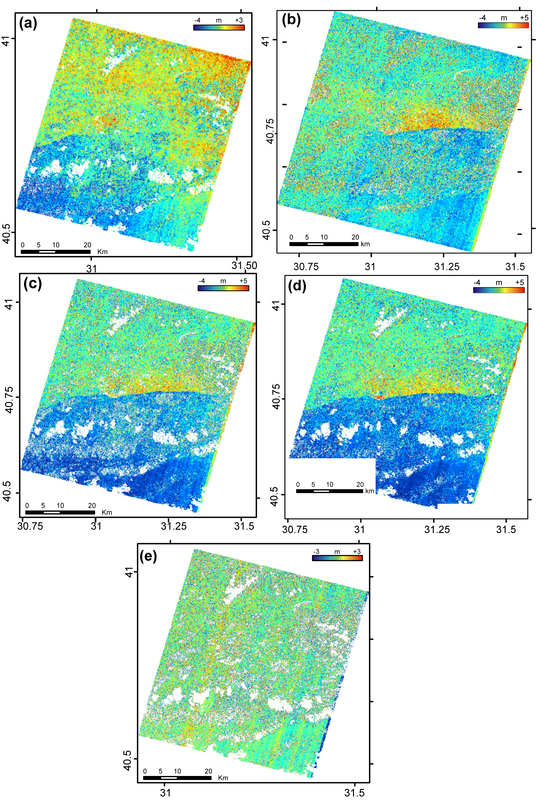 Distribution of slip derived from the inversion of the InSAR and GPS data only using a single planar fault. The fault plane view (top) and map view (bottom). The aftershocks (black circles) of Duzce earthquake (Bouin et al, 2004) are also shown. Figure S5. Slip distribution and rise time distribution for the smoother models obtained when the rake is constrained to within 175° and 205°. The associated misfits for the models below are given in Table S2. Figure S6. 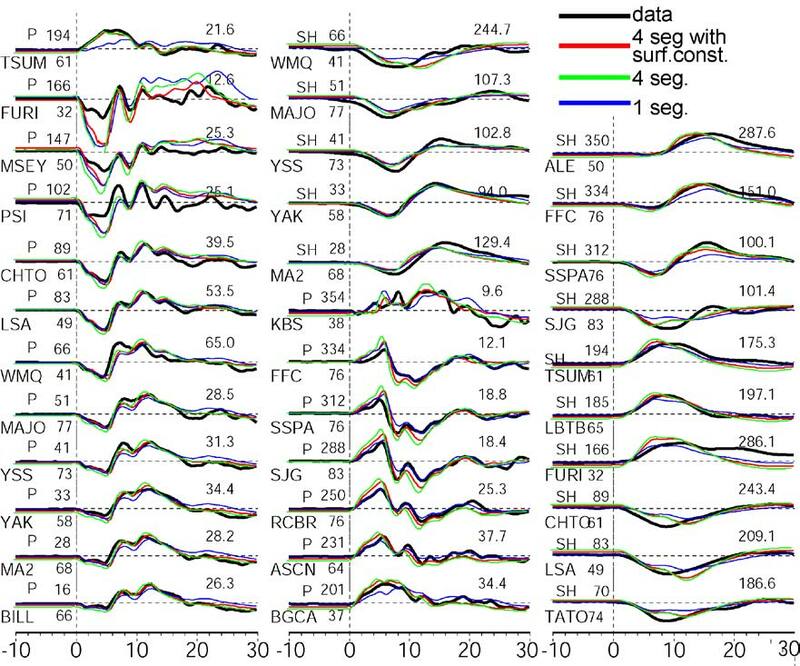 Comparison between observed teleseismic waveforms and synthetics predicted from the 3 models shown in Figure 9 of the main text.